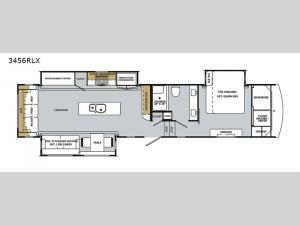 If you want a home away from home, then choose this Cardinal Luxury 3456RLX fifth wheel by Forest River! You will find true comforts throughout from the triple slide outs and the electric fireplace, to the 80" hide-a-bed sofa and the stainless steel residential refrigerator. Grab a drink and snack from the pantry and enjoy watching your favorite movie on the 50" LED TV at the entertainment center while relaxing on the cozy theater seating. Throughout this unit there is plenty of storage options between the hutch in the kitchen, a closet in the hallway, the linen closet in the bathroom, and the wardrobe, dresser, and closet in the front private bedroom, plus there are lots of overhead cabinets too. With the double vanity sinks, it is easier than ever to get ready for the day in the bathroom. At night, you can dive into the king-size Denver mattress and enjoy a great night's rest!